THE HELP FORUM: Ask Questions, Teachers Lounge, Tech Support, Contact Us. Newsletter Archive. 1. Create a series of free printable Teacher Training Handouts that will be available to both supporting and registered members to share with their fellow Sunday School teachers. More about this soon. 2. Help fund the creation of additional Writing Team lesson sets in 2019 and the training of new writers. The Teacher Training handouts will be formatted so you can share them with your teachers throughout the Sunday School year. They will be posted as part of our "Paste in My Hair" Blog -- which will soon be open to both registered and supporting members thanks to FPC's help. Our Writing Team has always had professional guidance, and now thanks to FPC's generosity, we will be able to provide more training to volunteer writers who want to unlock their creative lesson writing potential and work collaboratively with our Lead Writer and Editor. 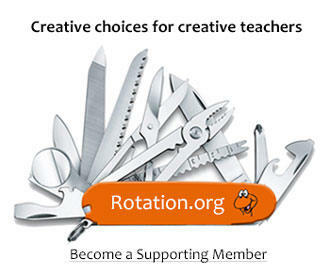 If that describes you, email Neil at webmaster.rotation@gmail.com. This is the second grant we have received from FPC Birmingham MI. The first in 2001 helped launch Rotation.org from its humble beginnings into the sharing community we have become. Thank you, FPC and Cindy Merten, their fabulous D.C.E. Special gifts are an important part of our annual budget. While most of our operating income comes from individual supporting memberships, special gifts allow us to go the extra mile. Our Board of Directors is pleased to announce the unanimous election of Amy Crane as our new President. Amy has been a member of the Board for several years. She has served as a Writing Team writer and occasional Team editor, and has been in charge of our growing Facebook presence. Known for her creativity, Amy has a special passion for teaching with drama, puppets, and the arts. This winter she will launch the Rotation Model in her church, Faith Presbyterian in Covington, LA -- the third church where she has done so. Thank you, Luanne for your kindness, creativity, and gentle leadership. You have been an indefatigable President -- leading us through some of our biggest changes and challenges since inception. While serving as Board President, you also took on the role of Writing Team Editor, all while you served your church as its Rotation Sunday School Coordinator (Hampton United Church in Hampton Ontario). What will you do with all your "extra" time now? Our guess: Grandbabies!